Applying for a Colombia work visa can be a real headache if you're not prepared. But by following my step-by-step guide below you should be able to get your visa without much stress. I'll be honest - sorting out a work visa can be more than a little frustrating. For this reason it's essential that you go to the DAS (Immigration) Office prepared with all the necessary documents. Follow these steps and you should be fine! - A passport which is valid for a minimum of 180 days from the date of application and has at least two blank pages. 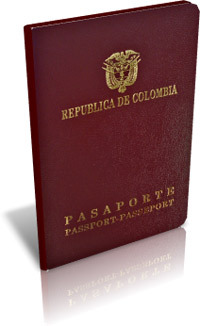 - A copy of the page in your passport which has the most recent entry or exit stamp to/from Colombia. - If you've had a Colombian visa previously, a copy of that visa. - Proof of qualification for the position you will be undertaking e.g. a degree certificate. Any certificates must be apostilled, translated into Spanish, and the translated also apostilled. - A completed 'Contract Summary' (Resumen de Contrato) form, signed by the necessary parties (you and your employer). This form can be found here. - A copy of your company/institution's Declaración de renta. - A Certificado de registro publico from the Camara de Comercio (Chamber of Commerce) for the company/institution you will be working for. - 4 passport photos (3cm x 3cm) with a white background. 2. If you're outside Colombia (e.g. your home country) things are straightforward - you simply go to a Colombian Consulate with your passport and present your documents. You can search for you nearest Colombian Consulate here. If you are already in Colombia, you'll need to leave the country as you have to enter Colombia with the visa in your passport. You best best is probably to go to Venezuela or Ecuador depending on which part of Colombia you're in. 3. You go to the consulate or DAS office and present your papers. They will check them and ask you to fill in a form. You pay for the visa. Currently the cost is US$225. If there are no problems (and there shouldn't be if you have everything) the official will stick the Colombia work visa in your passport and sign it. And that's your Colombia work visa sorted! 4. However, you're still not quite finished! You now have to go (back) to the DAS office to apply for your 'Cedula de extranjeria' (Foreigner's ID card). The cost for the 'cedula' is about US$80. You need to make a 'consignacion' (bank deposit) at a branch of Davivienda bank and take the receipt back to DAS. 5. The official will tell you when you can return to collect your cedula (usually within about 2 weeks). - Arrive early, preferably 15 mins or so before opening as queues can sometimes be quite long. - If possible try to leave a few days spare in case you need to get some more documentation (which may even mean having something sent from your home country). - Take extra copies. If they tell you to take 2 copies of your visa, take 3 or 4 just to be on the safe side. - The DAS officals don't generally have a reputation for being all that friendly - in fact some can be downright rude - but remaining pleasant and smiling (even if you don't feel like it!) will probably stand you in good stead. - Dressing smartly can also help.